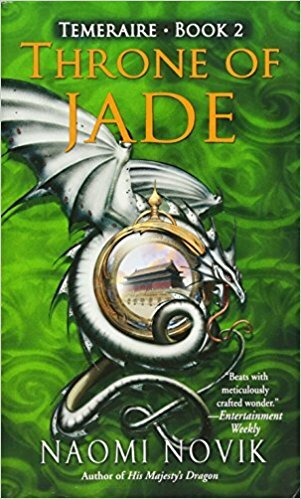 In this second Temeraire novel, things start off with quite a bit of conflict as a delegation of the Chinese has come to claim Temeraire back. The dragon nor Laurence will have any of it, but some British military leaders persist until Temeraire gets upset and instead attempts to kidnap Laurence to protect him. After some discussion Laurence and Temeraire are sent together with an English naval ship and the Chinese delegation to return to China to salvage the diplomatic situation, especially before the Chinese decide to support Napoleon, believing the English have insulted them and stolen apurpose the egg housing Temeraire. While on the ship, strange things keep happening, and Laurence suspects the Chinese prince Yongxing will try everything in his power to get Laurence out of the way and keep Temeraire. Why? Because only royalty is supposed to be allowed as companions to Celestials, which they've discovered Temeraire is, and Laurence is absolutely deemed unworthy of the greatest dragon breed in existence. There is a lot of murky diplomacy and politics, action and death, and the tension between the naval officers and airmen doesn't help matters, especially when no one trusts the Chinese. Still, overtures are made to the Chinese to encourage an alliance and goodwill, though these seem to create more issues than help matters.